While mulling over what to do with our surplus of basil, Andy suggested basil sorbet. I was a bit skeptical, but thought it would be a fun experiment, so I agreed. There are lots of recipes out there, but we chose one from The Kitchn. 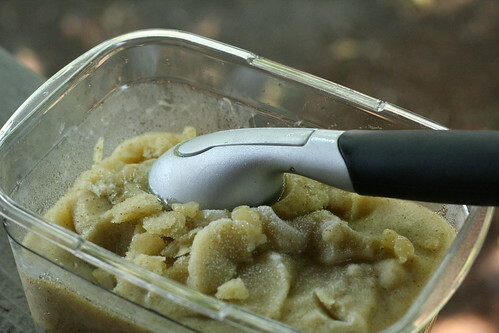 The main essence of this sorbet came from the Granny Smith apples that serve as the base. Their tartness and apple-y flavor really came through along with the basil, which I loved (and Andy didn't). Overall, this was a light, refreshing, and different dessert, but I prefer more traditional flavors of sorbet. This is my entry for Grow Your Own #33, hosted by MomGateway. 2-3 cups packed basil or mint leaves, plus 1/4 extra for garnish. 1. In a medium saucepan, bring 2 1/2 cups water and the sugar to a boil. Add the apples, and simmer over medium-low flame for about 2-3 minutes, or until apples easily break apart with a wooden spoon. Add the basil leaves. Cover, remove from heat, and allow to rest for 10 minutes. Place the mixture in a blender and blend until smooth. Strain through a fine sieve into a metal bowl, stir in the apple juice and lemon juice. Allow to cool in refrigerator, or over a larger bowl of ice water. 2. Once cool, pour mixture into the bowl of an ice cream maker and freeze according to the manufacturer's instructions. When sorbet is frozen (it will still seem quite soft), transfer to a storage container, cover tightly and freeze until ready to serve. Before serving, garnish with basil leaves. Hmmm... Green Apple Basil Sorbet sounds like an interesting combination! Last summer I lived by a Gelato place that had pineapple and basil sorbet. It was AMAZING!! This sounds absolutely wonderful! Yum! We have so much basil I've been thinking about trying something like this. It sounds fantastic.